Come learn about The Principles of Our World. 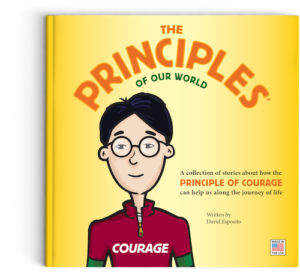 In a series of real-life stories, readers will be introduced to The Principle of Courage. The stories in this children’s book are meant to remind all of us about the importance of courage in our lives. Enjoy the book in one sitting or read just one story at a time. It is never too early in the development of a child to start talking about the importance of principles like honesty, courage, and teamwork. This book is part of a series of books about The Principles of Our World that provide parents and teachers with the opportunity to read to young children (ages 4+) and talk about a variety of situations they will experience in life. For young, independent readers (ages 7+), The Principles of Our World book series is a great addition to their book collection. At the end of the book, there is a section called, “Where Do We Go From Here?” This section is designed for children, parents, and educators to discuss situations they will encounter in life and talk about how The Principles of Our World can help them effectively handle these situations. The Principles of Our World are here to help. “Hello, I am The Principle of Courage. “People say that I am the reminder they need to be brave when they feel worried and afraid. “There will be times in your life when you are afraid. We all get afraid. “I will help you to be brave and strong when you are afraid. “You are stronger than your fears, and I will help remind you of your strength. “My parents told me that even though I am small, I have the strength to face giants and overcome my fears. That is why they named me Courage. “Please call on me when you need help to face your fears. I can help remind you of your strength. “I will be there to support and encourage you—no matter what situations you experience in life.